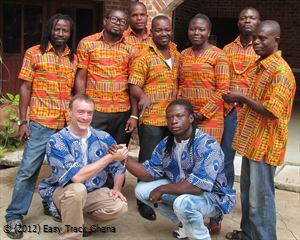 Easy Track Ghana provides individual and small group travel services to recreational and business clients. Easy Track Ghana seeks to differentiate itself as a premier travel agency in Ghana by providing boutique one-on-one service to let travelers experience African life on a personal level not often accorded to casual visitors. En voyage virtuel sur le ​web​, j’ai admiré sur la page d’accueil la beauté des images présentées sur votre site. Que ce soit pour la végétation ou la plage, toutes les ressources naturelles de ce pays semblent paradisiaques. Est-ce une ​expérience ​à faire​ en famille ? These travel agencies keep some importance in the life of people. We at Homework Writing service also take help from travel agencies when we have to go on a tour. Easy track is doing a great job here. But there is another site and i think it is www.memorablevacationinghana.com that is full of rich information. I wanted to visit all wonderful places in Ghana. For that I have reached Ghana before 2 days. So that I need your services as soon as possible. I have only two weeks time. I can arrange a meeting in the hotel where I have been staying. catalina hotels in the city! Will you come? Traveling to Ghana is the most beautiful experience in my life. I have been looking for which is the best website to write my essay and fortunately got here to share my experiences. This blog is just amazing in providing information on ghana.